Sometimes products fall short of the pre-release hype and rumors that precede their official launch. I was thinking this the other day about the iPad and the difference between what I imagined it would be, and what it turned out to be. And thinking more about it, it would have been more appealing to me (the argument to purchase one clearer), if it had been what I imagined. Don't get me wrong the iPad is a phenomenal product and it's launch a runaway success but I thought it was going to be something a little different, and a clear addition to my arsenal of computing devices. I thought...it might be a device that had a more appealing fit between the iPhone and the Mac notebook, both of which I owned at the time of the iPad's announcement and still own today. I thought the iPad might be a device that had a niche purpose and form factor, like the iPhone, and fit like a "nested doll" between the iPhone and the Mac notebook. 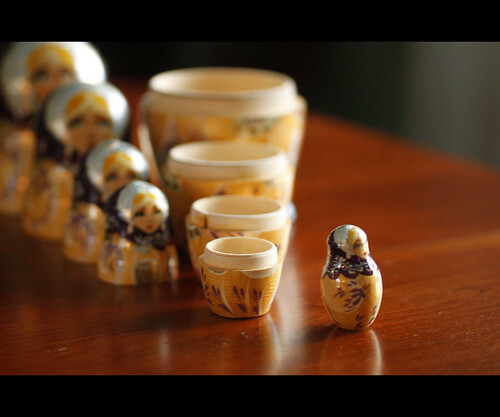 The "matryoshka" design pattern describes this nicely. This design pattern describes an "object-within-similar-object" and appears in the design of many natural and man-made objects. For something like the iPad sitting between the iPhone and the Mac notebook this would be extended to be an "object-within-similar-object" with added inheritance/leverage of the embedded object. So what if the iPad was a middle doll in a matryoshka doll set. What if the iPad served as the 15/17 inch screen of a Mac Air, Mac Book or Mac Book Pro notebook when it was embedded. It would have all the features it has today in it's standalone state but it could also embed into the Mac notebook and serve as the screen. When it was docked the combined object would use the Mac OSX and all the applications and you could use the Mac keyboard. All all the resources (folders, documents, contacts etc.) on the iPad would be available to the Mac notebook and potentially applications written for the iPad would be available also. When it was undocked the iPad would run on the iPad OS and function as a standalone iPad. This would allow you to select the form factor that made sense for the task at hand. If you wanted to goto a meeting or you were on the run or you were sitting around the house and wanted to surf the internet or check your email you might just grab the ipad (the screen) from the notebook and leave the rest behind. For more serious work requiring a keyboard and a more powerful operating system and applications (OSX versus iPad OS) you would plug the screen back in and use the Mac Book as a notebook. Taking this a step further to the smallest doll, the iPhone, what if the iPad had a docking station or slot where the iPhone could be inserted completely. So when you inserted the iPhone into the iPad you could make phone calls/use telephony from your iPad or your Mac Book. Using Internet Tethering would be seamless as well. Of course each device would sync data and portable applications when nested. In this model there is a clear fit for the iPad in the form factors, and it would have been much more appealing to me, as an iPhone and Mac Book Pro owner. Anyway that's what I thought.